It has been another busy week, but not quite as bad as last week, thank goodness. Straight into the pictures though…starting with a big finish! I’m not entirely certain about it. 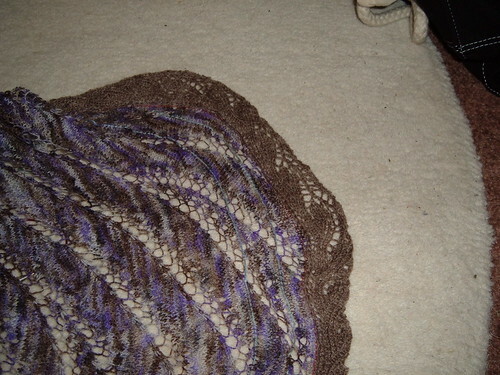 I think it looks like the border is just a different colour deliberately, but it’s so hard to see it objectively. I’d welcome some honest opinions, if anyone has one to share? 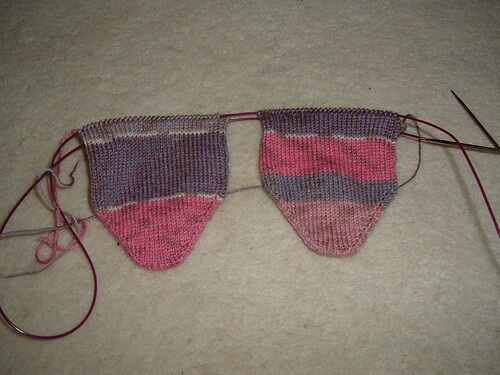 I’ve also been knitting away at a pair of socks…I was never going to keep away from the socks for long! This pair is using the ball of Wendy Happy yarn I bought in Paignton, while on holiday in October. Every time I pick them up I smile, because they’re called Happy and also because I remember holiday. They are very far from being identical, but that’s alright, I like them. These are my travel knitting, for bus journeys, train travel to Bristol and back and also for lunchbreaks at work. I was knitting these on the bus on Monday morning, on my way home from a blood test, when a little old lady sat down next to me. We chatted about the weather for a few minutes, as you do, then she asked what I was knitting. I held them up and said ‘Socks’. “Oh lovely”, she replied, “Are they for your dolly?” Really?! I mean, what? I never used to look my age, but I certainly no longer look young enough for a dolly. Surreal. Anyway, this week promises to be another busy one. We have our nephew Liam coming round this afternoon for a craft session, as part of his birthday present. I’m in Bristol twice this week, for meetings, and I’ll miss knitting in the library because of it. The rat man is coming back at some point, and hopefully we’ll be able to get an electrician to fix the wiring very soon. And we have to start thinking Christmas shopping at some point. 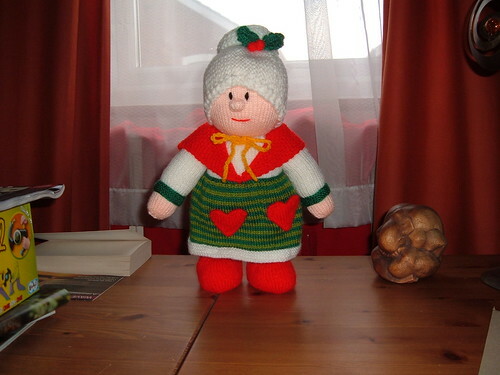 This entry was posted on December 5, 2009 at 11:07 am and is filed under Cross-Stitch, knitting. You can follow any responses to this entry through the RSS 2.0 feed. You can leave a response, or trackback from your own site.